Unlike in the past, business owners now have several options in terms of banking, getting business loans and finding other necessary banking services. Traditional banks and credit unions now compete for business from entrepreneurs and established companies. If you're looking for a banking solution that makes the most sense from a cost perspective, or logistics, or any of the other reasons why people choose one bank over another, you may find that credit unions can serve your business needs better. Read on to find out the pros and cons before making a final decision about which type of banking institution makes the most sense for your business. A credit union is a financial institution owned by members with common interest. For example, teachers may decide to form a teacher's union or people from a common location may decide to form their own credit union. Credit unions are set up as nonprofit entities, meant to provide affordable financial services to their members. If you want to have a savings account that accrues more interest, then depositing your company's funds in a credit union is the best alternative when compared to banks. Credit unions often pay higher interest rates on all deposit accounts including savings accounts, checking accounts and money market accounts. Statistically, depositors generally earn a greater amount on their deposits from local community banks and credit unions. Traditional banks have never offered interest rates better than credit unions. In most cases, only online banks have rates that are at least comparable to rates offered by credit unions. As a business owner, it is always good to know that there are a variety of ways you can get loans to boost your business. However, it is not just about getting a loan, but also the amount you are likely to be charged in interest. In order to have a smooth operation for your business, identify lenders that charge the lowest interest rates on loans and lines of credit. You'll likely find that this does not include traditional banks. Mortgages, personal loans, business credit cards, business loans and business lines of credit given by credit unions are relatively cheaper compared to traditional banks. According to research, traditional banks charge rates that are a point or two higher compared to what's charged by credit unions. Thus, getting a mortgage or business loan from a credit union is cheaper than taking either from a bank. This is another significant difference between credit unions and banks. Credit unions tend to charge a smaller amount of fees on different transactions as compared to banks. Most credit unions do not have a minimum required balance on checking accounts. Moreover, they do not charge a monthly account servicing charge. This can save your business hundreds of dollars per year. Additionally, most transactions such as checks, withdrawals, and electronic transactions are also free of charge. Lastly, credit unions charge fewer or smaller fees on bounced checks and overdrafts. Overall, they generally charge less on their daily transactions compared to banks. Many people who have dealt with both banks and credit unions might tell you that credit unions are easier to deal with compared to traditional banks. Many times, credit unions will readily accept people with a troubled financial past (poor credit history), as they have less stringent regulations as compared to traditional banks. On the other hand, banks have many branches and have a large number of customers. The probability of a bank declining your loan application due to a low credit rating is very high. After all, losing one customer is not an issue to them. If you are a member of a credit union, your application may go through even if you do not meet all the requirements. Since credit unions are smaller in size and often have fewer members compared to banks, they often do not have web-based features that can allow customers to do much online banking. Credit unions that have an online presence may only allow customers to do simple transactions such as transferring funds and checking recent account activity but nothing more. With traditional banks, the online interfaces can allow you to see recent activity, transfer funds to another account, apply for credit cards, apply for loans and even pay bills. Traditional banks definitely have a stronger online presence and functionality compared to credit unions. Credit unions offer fewer financial products in comparison to banks. Traditional banks have a variety of checking accounts, distinct types of loans, different credit cards and even a wide range of mortgage loans to choose from. This gives the customer freedom of choice since there exists a wide range of products that suit their personal and business needs. Belonging to a credit union limits your freedom of choosing financial products. The members are limited to only specific financial products with no room for any real selection. This may be a big limitation for a large business but perhaps not much of an issue with small to mid-size businesses. Unlike banks that have physical branches countrywide, credit unions only operate from a few locations. This means that if a member relocates to a different city, it could prove very difficult for them to do their transactions. 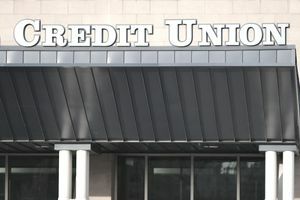 Furthermore, the online presence of most credit unions is also poor and requires members to be near a physical branch to perform many common transactions. When choosing where to do your business banking, take the time to review the pros and cons of each one and decide which type of banking institution will best serve the needs of your business both in the short term and long term.